After we sold our herd, we had all those empty barns. We were happy to fill them up with heifers to custom raise. At one point we had close to 700 animals. It was a beautiful sight seeing them all lined up eating. We are quite proud that we raised some superior animals. However, 2007 brought ever increasing feed costs as the grain market soared to record high prices. It is no longer cost effective for us to continue to raise heifers. 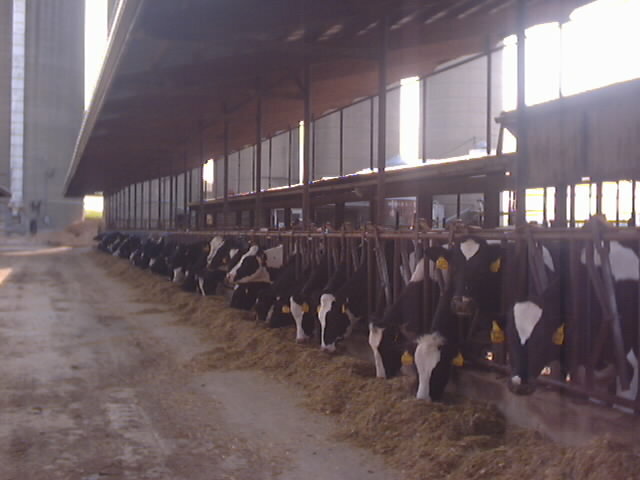 As of the end of Feb. 2008, the barns were once again without animals. Never fear, these guys are doing a pretty good job filling them up with other "stuff". 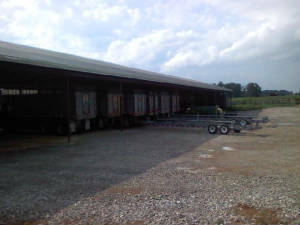 The picture above shows how one of the barns...the "VPI" counterslope barn on the East side "up the hill"... underwent a major transformation this year and now holds all the trucks. 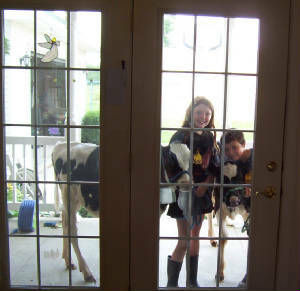 The last two Aprils, we had some cattle visiting for a while. Our neighbor is an ABS trainer and he brought in some cows for a couple of days and conducted classes. I loved waking up and hearing cattle again (especially when I knew they didn't need to be milked). One morning recently, we heard the sound of cows in the yard...and our Amish neighbor called to tell us there were cows on the road (and yes, he called on his cell phone). Seems another Amish neighbor had turned heifers out and hadn't checked fences. It's bad enough having to walk around cow piles when they are your own animals....it's very frustrating when they belong to a dumbass neighbor! Life is an ever changing adventure.. it is always interesting to see what the next chapter of our book brings. Megan, Jake, Jason, Ali, and Justin all took heifers to the Fair again this year, now so we had five black and whites occupying some pens for a few months. THANK YOU!!! to Matt Steiner for letting them use five beautiful animals! I think 4-H is a wonderful experience for children. Our grands are members of the same 4-H club..Apple Creek Wide-A-Wake..that Jim, and our children belonged to. This picture is really old...Megan is 16 now and Jake 15....but I am leaving it here, as I enjoy seeing it. That's my perogative as the owner of this site...and their Nana. midi playing "I Go Out Walking, After Midnight"
Appropriate here because every now and again those girls would decide to take a walkabout (as Croc. Dundee says). That is one aspect of the heifers I do NOT miss!! Won't seem the same to not have heifers leaving their footprints (and other things) in the lawn!